Even if you’re already in a Capital Campaign, you could discover something you missed and also enjoy the benefit of the presenter and group wisdom and sharing yours. Once your strategic plan is done, your next move will be to create a Master Plan. Whether it be for new facilities, new programs or re-organization, you want to have identified your overall needs in order to move forward. You must have a solid strategic plan before moving forward. Effective strategic planning articulates not only where an organization is going and the actions needed to make progress, but also how it will know if it is successful. Every piece of your campaign will depend on this plan. What are you planning to raise funds for? Do you have all the facts needed? Estimates for any construction, re-purposing or new programs in place? You will need to articulate the reasons why these funds are needed in a prospectus or case for support. A Campaign Planning Committee can be of help here and in the next steps. Who are the best prospective donors for your campaign? Do you know them personally? Are they engaged with your organization? What do you know about their interests? What do they know about your programs and people? Now you will move to doing a campaign planning study or assessment. The responses to this work will give you more information on your potential donors and act to engage them more deeply in your plans for the future. Here you go! 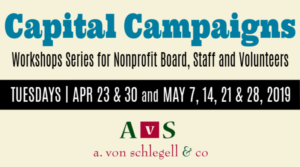 Now you enlist your Campaign Steering Committee and Campaign volunteers, make your initial asks to your top potential donors, work through the Silent phase of your campaign till you reach at least 50% of goal and then go public into your community. A minimum of 7 attendees is required per session and a maximum of 20.